Get ready for an Oktoberfest that has it all! From Europes most explosive OOMpah-Rock style trio to traditional OOMpah bands, special DJ and the ever popular Tonic Band...Bingemans Oktoberfest guarantees to take your celebrations to a whole new level! PROST! Official Bingemans Oktoberfest Anthem Coming Soon! 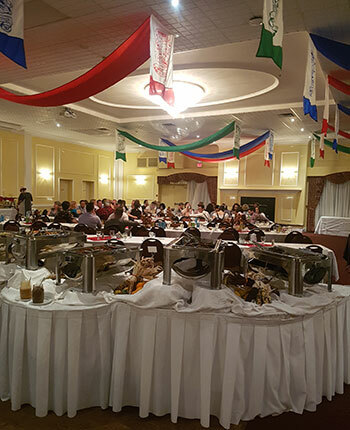 Indulge in traditional Oktoberfest food at Bingemans Bavarian Feast! Our chefs are proud to present some of the most delicious German food at this year’s Oktoberfest in Kitchener-Waterloo – Canada’s greatest Bavarian festival! Enjoy Marche dining with traditional Oktoberfest food, exclusive entertainment and express access to the main festivities in the Oktoberfest Kool Haus. Indulge in authentic German schnitzel, Oktoberfest sausage, sauerkraut, spaetzle, and of course craft beer! Need a break from all that polka? Test your axe throwing skills right inside the KOOL HAUS tent! Upgrade your Oktoberfest experience and enjoy being a VIP for only an additional $15! Music, it’s all about the music! This is truly a crowd pleaser by creating a theme night and programming the music to suit the audience. The music will be played that works for our crowd. Whether you like hip hop, R & B, pop, rock, old school and of course retro...PAULANER HAUS will provided the mix that will work for you! The tradition continues in bringing back Retroberfest by continuing taking requests. The requests and the response on the dance floor will provide pure entertainment. Again all the best music and all the best music videos for your night out. Lulu’s Band is once again in our entertainment lineup, now performing in Paulaner Haus! Their performances are well known throughout Southern Ontario and more. This group has grown to include new fans of all ages and have become a popular attraction at festivals, etc. This band is a guaranteed ‘party’ wherever they play. They keep the dance floor hopping with the best dance music from Classic Rock to Current Hits, and even a bit of good ole Country. Again, we listened and wanted to give our community something they have never experienced at the KOOL HAUS. Bingemans is proud to present the Tonic Band. This high-energy Montreal-based top 40 group made up of young, dynamic and highly experienced instrumentalist and singers. Each of the 9 band members has toured internationally and upholds the highest standards of live performance. They will give you a grand experience with their get-up-and-go spontaneity and get the crowds involved. George is Gemutlichkeit personified. George has been the longest running Bavarian entertainment act running and as well, rolling in the barrels for tapping for the past 51 years. The self-described professional entertainer has become a party icon in Ontario and far beyond. He is the undisputed “Mr. Oktoberfest” as the leader of the oompah-pah band the Oktoberfest Express. George employs his infamous interactive techniques, getting right into the audience and bringing people into his act in a way that would make any rock star envious. He also performs his trademark move – drinking two beers while standing on his head. George is Gemutlichkeit personified. George has been the longest running Bavarian entertainment act running and as well, rolling in the barrels for tapping for the past 51 years. The self-described professional entertainer has become a party icon in Ontario and far beyond. He is the undisputed “Mr. Oktoberfest” as the leader of the oompah-pah band the Oktoberfest Express. George employs his infamous interactive techniques, getting right into the audience and bringing people into his act in a way that would make any rock star envious. He also performs his trademark move – drinking two beers while standing on his head. Stay tuned for an exciting act joining George this evening.